Amazon Echo with its Alexa voice-based personal assistant has made quite an impression on our household including my children. Elbrie has enjoyed using Alexa at our house and asked me to put together an overview of how the Amazon Echo experience works in practice in a family. It's important to note that Alexa has been designed for adults and teenagers rather than children and there are no parental controls at this point. There also doesn't seem to be a way to give permission for COPPA compliance in the US for voice recordings to be stored for under 13s (Alexa stores voice recordings of commands.) For families with older children you should definitely have a discussion and make sure that they understand that their voice will be recorded and that parents (as account owners) will be able to listen to historical commands. You'll also want to explain Alexa to guests. Alexa is a personal assistant that you can use to get information, play information, make purchases and control home automation devices. You can use Alexa with the Amazon Echo which has a built-in high quality 360 speaker and microphones that can be used over a wide area, or with Dot a smaller device which can be connected to an existing speaker system via Bluetooth or an audio cable. There's also the Amazon Tap which is a portable device that you must tap to make it listen. 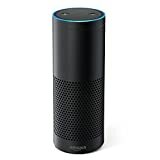 On the Echo and Dot Alexa is always listening for her keyword (which can be changed to Echo or Amazon.) The Tap must be tapped first. There's also a voice remote for Echo and Dot if you need to control things from a room where you don't have a device. You should be aware that Alexa requires an internet connection and audio is streamed to the cloud once the 'wake word' (default Alexa) is detected. The light on top of Alex goes blue when keyword is heard and data is being streamed. You can delete stored recordings. We do get false positives with the word Alexa though so that's something to be aware of. Amazon are obviously focusing on this issue, but there's clearly a trade-off between privacy and convenience. When talking about Alexa rather than to her we try and remember to refer to her as 'she who cannot be named' to avoid confusion. Alexa has transformed our morning and evening routines. In the morning she lets the kids know when it's time to get breakfast, get dressed and leave the house. In the evening she lets them know when it's time to get ready for bed. At the moment the alarms are just an alert sound that you have to turn off with a voice command to stop the noise. My kids quickly worked out how to set up repeating alarms and one off alarms. This really takes the conflict out of our routine. I don't have to tell the kids to stop playing Minecraft, they just know it's time and get on with it. I had been using my FitBit for this kind of alarm, but having it centralized is much better than me having personal alarms and then having to remind the boys. It's rather like we've been programmed to respond to events. In our house 'google it' has been partially replaced with 'ask Alexa'. This works particularly well when we're eating a meal. We've never had a rule about no devices at the table, it's never come up, we just don't. But now we do ask Alexa things that help with our conversation. I have no idea how we got on to the subject but recently the kids wanted to know how old Queen Victoria was when she died. Alexa was able to tell them and also let them know that she died at Osbourne House on the Isle of Wight (we've been there.) If we hadn't followed that up straight away then we would have forgotten about it and they wouldn't have made that connection. My 8 year old loves asking Alexa for facts about whatever he's interested in. Our Amazon Echo is in a shared family room so my son doesn't have unsupervised use. My kids seem more interested in testing Alexa's knowledge of Mongolia than asking anything inappropriate. YMMV. Since we got our Amazon Echo we've played a lot more music. We've tried lots of ways to share our music in the past, but the Amazon Echo has been the most successful. Personally the times when I want music on are when I'm not at a computer - when I'm cooking, doing housework, playing with LEGO, etc. It's much more convenient to use voice commands. My kids have very different tastes in music and when we first got Alexa they did spend some time changing the music back and forth to their preference! But this has settled down over time and we take turns to choose music. The shopping feature that we use the most is just adding things to a shopping list via voice commands. This shopping list isn't connected to a store, I just check it when I place a supermarket shopping order for delivery. This is so convenient as you usually realise that you've run out of something when you're not at a device. The kids can also add things if they use the last of something. We've had some hilarious experiences when Alexa hasn't recognised the item we've requested and added something entirely different to the list, but overall the voice recognition works pretty well. You can also use Alexa to shop for Amazon Prime items. You'll be pleased to know that you can set up a pass code for voice ordering so that the kids can't order every Skylander ever made. Of course this means that you can only order things when your kids aren't listening. I enjoy shopping via the website and tend to consider and research every purchase so I don't think I'll be using this feature much. Our house has been automated for around 12 years now. We've wanted to use voice control from the start but didn't have much luck. That has finally changed with the Amazon Echo. We've often been asked how kids and home automation go together. People seem to imagine that kids would spend all day opening and closing curtains with the button. They don't. It becomes normal and mundane to them. Voice control is the same. There's an initial novelty when they try turning the lights on and off but after than it just becomes the normal way to do things. The Amazon Echo has a 360 degree speaker which works really well for us. We've got it positioned so that it can be listened to from most of our open plan living area. We've been pretty impressed with the sound quality and it's plenty good enough for causally listening to music. You can choose the smaller Echo Dot which only has a basic speaker and hook it up to your own sound system via a cable or Bluetooth. For us it made sense to go for a combined device as we didn't have a suitable speaker in a central location. We've only got one device to worry about, it just works. The microphones (Echo has 7) work from multiple directions. I can add things to the shopping list from the kitchen, the boys can ask Alexa questions when we're eating a meal and we can ask Alexa to put music on when we're all in the living room. There's no need to walk up to Alexa. We've tried lots of voice control solutions over the years. We're really impressed with Alexa. The voice recognition works really well. I have a slightly regional accent and she copes just fine. Even more impressively she copes with the children's voices. Optimising voice control for children is hard (lots of tech toys have struggled with this.) But Alexa does a good job. Very young children may struggle to make themselves understood, but my 8 year old can talk to her as long as he remembers to talk clearly and ask for sensible things! Alexa is pretty intelligent and copes with different ways of asking the same thing. She also learns your speech patterns. There are also extra 'skills' available for Alexa including ones written by third parties. You have to enable these. You can get Alexa to order food for you, teach you stuff, talk you through an exercise routine, quiz you and lots more. We can imagine a much more tailored experience for children in future, especially when voice recognition is able to identify individual voices and apply different permissions. Amazon have recently added Alexa support to Fire tablets. But at the moment you can't use Alexa if you have parental controls on. We expect that this is because Amazon hasn't worked out what to do about parental controls for Alexa yet (other than purchasing.) 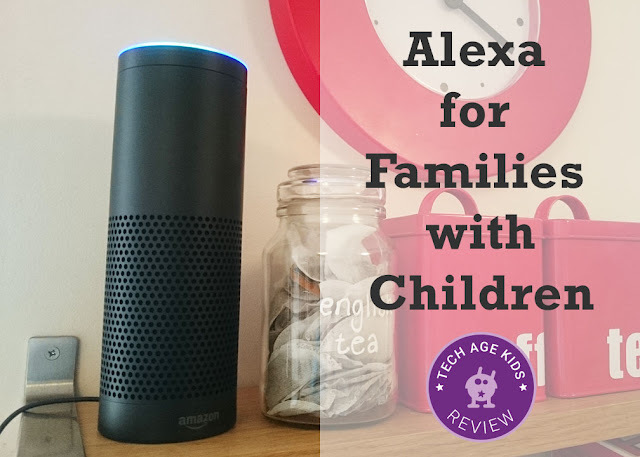 Alexa really appeals to children so we're hopeful this will change in the future. Having Alexa feels very sci-fi. We say 'she' and 'her' (except my 8 year old who used 'him' and 'he' initially, probably because he's familiar with the name Alex not Alexa.) I naturally find myself saying thank-you to Alexa. My younger son sometimes has hilarious conversations with Alexa when she is unable to help him with his implausible questions and she apologises profusely. This is a taste of how we'll interact with technology in the future. No need to type or even get a device out - the technology comes to us. The voice recognition is the best I've experienced but it's far from perfect. It's very funny when Alexa adds a catalogue to the shopping list (huh?) instead of putting the kettle on. 'turn the kettle on' works well, but I want to say 'put the kettle on'. Alexa seems to be learning this as I can now say 'put the kettle on' most of the time. There's usually a mysterious catalogue on my shopping list though! The bottom line is that Alexa is really useful. The Amazon Echo is a good choice if you want something that just works out of the box and you don't have existing speakers that you want to connect to. Dot is good for extending coverage to other rooms and for people who already have a sound system they want to connect to. Tap gives you a mobile option that you can take into the garden or move from room to room, it has a rechargeable battery and only listens when you tap it. It's early days for working out how children and voice control go together in terms of privacy and parental controls.